In a blog that I don’t think I’ll publish, I discussed the importance of proper pronunciation. That rant focused on how commonly people drop Rs from words such as “library” and “February.” And while I do find that tendency annoying, the blog itself was just a little too pissy – even for me. That said, pronunciation is still important. Are you in front, or dealing with a heavy metallic element? (Lead, if you were wondering.) 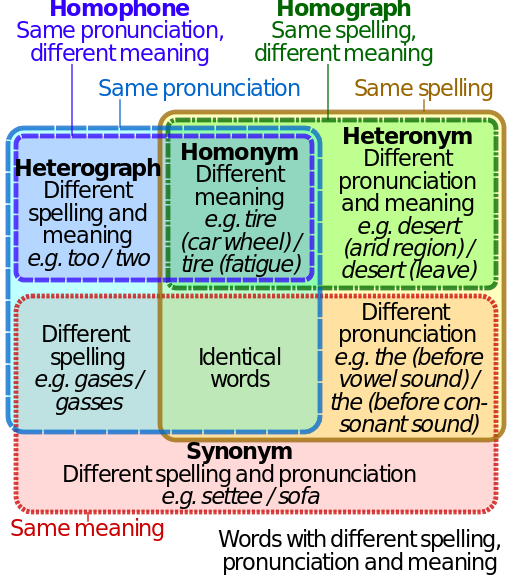 Wikipedia does a decent job of breaking down the terms for words that confuse because of their similarities in spelling and/or pronunciation and differences in meaning (grouped under the term Homonym). For the graphically inclined, check out the stunning Venn diagram from Wikimedia Commons. I won’t go further into the topic. 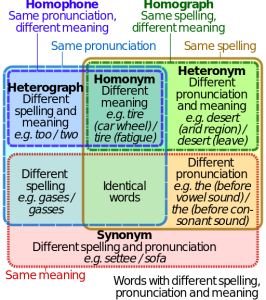 Homonyms and silent letters (sorry, not R in American English), do introduce a special kind of hell when it comes to getting a word right – kids and people learning English generally get a pass. However, once a person knows better, mispronouncing words becomes a sign of extreme jerkdom. There are some reasons why a person regularly mispronounces things; but to consistently – purposely – get words wrong is a shooting offence. Names are the easiest example. Most of us know someone with a unique name. We probably had to spend some time leaning to say it properly. Now, we also probably know someone else who thinks it’s such fun to never get that name right. How do you think the holder of the name feels? Especially because they know more than one jerk who likes to say it wrong. Maybe not as annoying, but people who refuse to pronounce words (any word) correctly begin to look like idiots – even IF everyone understands the meaning. And that’s the point. How understandable is that person really? Even if you understand them, how seriously do you take them? Would you want them to represent you professionally? Personally, I don’t want them to represent the species – but I’m particularly rigid. I primarily work with the written word, but I am a Word Nerd and my passion is Clear Communication. How we speak greatly impacts our image on a daily basis. Often, how people speak produces the same reaction as when my computer crashes (open palm, insert face). Unless you want your image to be “I’m a Moron, Don’t Take Me Seriously,” I suggest you train your brain (and tongue, if need be) to start pronouncing words properly. One Response to Properly Pronounce! I’m surprised you didn’t use “forte,” as in that is/is not in my area of expertise, as an example. I avoid using the word because no one would understand me if I said it correctly (fort) and I don’t want to say it incorrectly (for-tay).